← Hub Haps #008-was it Camera Day? It’s been an interesting three weeks since Part 2 (and before that, Part 1) of this project to reverse engineer and make operational a twenty year old CNC lathe and mill at my favourite local high school. If you like anything about the video above, we can all thank my son Calder. Upon showing him an early version of the video, me: “Well?” Him: “Needs to be much shorter and you need to point out what you’re talking about.” I like that clarity of feedback. 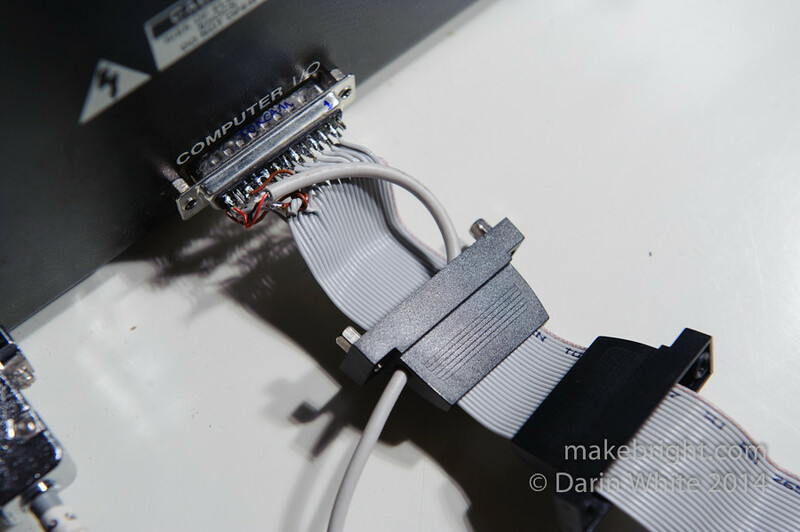 The TL;DR: I’ve constructed a functional adapter cable to connect a standard PC parallel port to the proprietary 25-pin data port on the TORCAM controller. 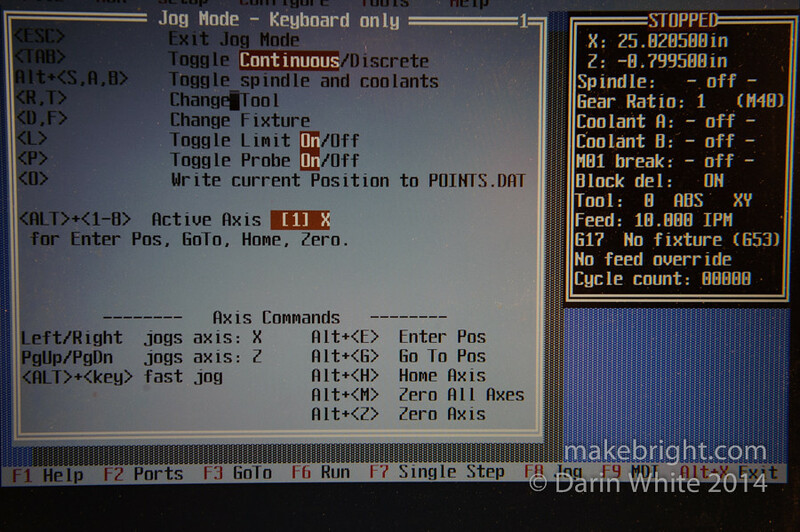 This should allow the school PC’s running Mach3 to control these tools. It’s time to take this rig back to the classroom and try driving the actual lathe and mill rather than just my test motors. three weeks ago this setup looked like a slam dunk. Cable signal wires carefully redirected to appropriate pins. Unused-buffer inputs carefully grounded. 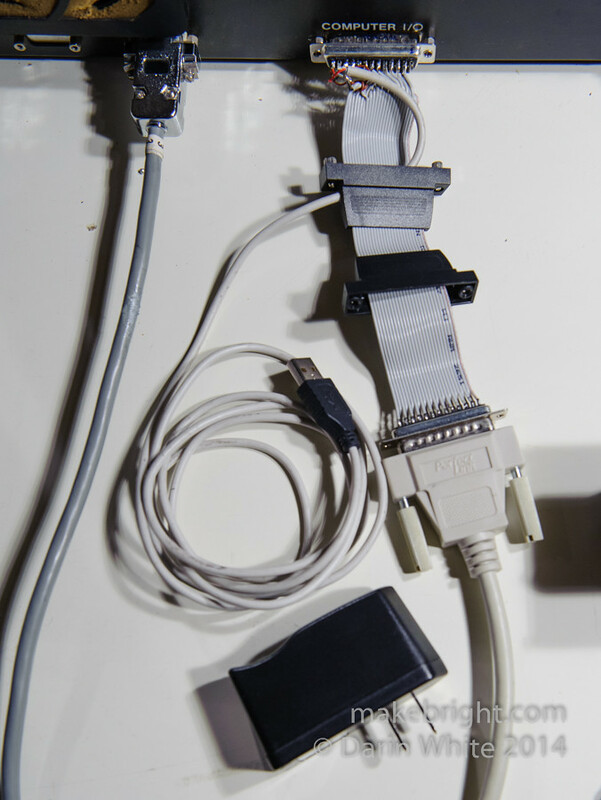 USB-provided 5V on pin 13 to supply the internal buffers in the TORCAM box. Positive and negative tests on the cable passed. 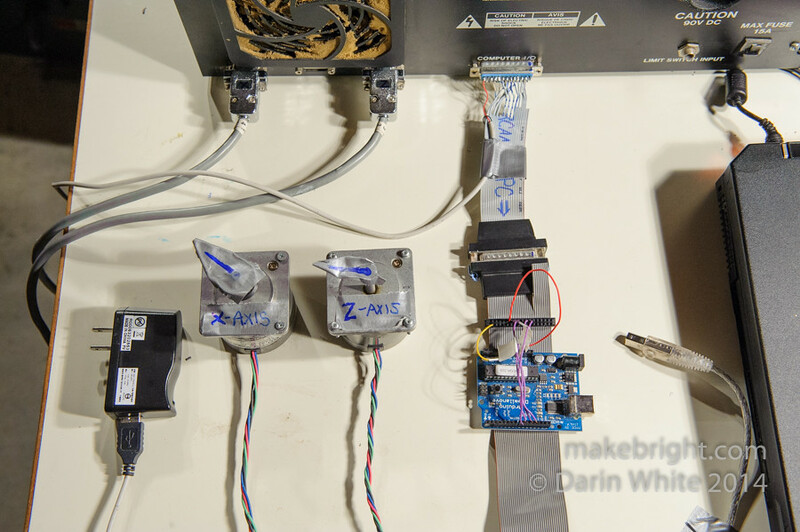 A little trial and error to correctly hook the TORCAM motor driver outputs to my stray-mutt test motors pulled out of some dumpster-trawled line printer years ago. And it did work. Three or four successful test runs, being careful not to overheat the undersized motors. Then on with the hot glue for cable strain relief. Buttoned up the box. Shot the victory video, and then… the Z-axis started to freak out, stuttered, twitched, and then stopped completely. Hardware debug time. I swapped the motors on the two axes, and Z motor ran fine hooked to X controller, so nothing wrong with the cable or motor. Tested resistance on DB-9 motor connector back to the pair of L6203 full bridge motor drivers. All good. Same test on the data pins 6 and 7, Z-axis step and direction. 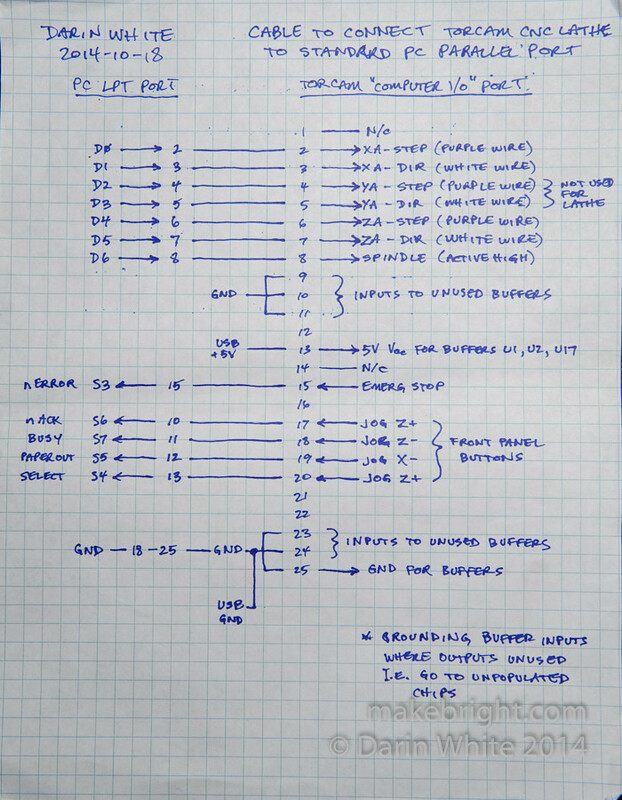 Double-checked config of output pins in TurboCNC. It seemed unlikely that they would spontaneously change, but cosmic rays being what they are, I checked. Good. Considered that ESD (electro-static discharge) may have possibly killed any and all chips in the mix. It’s the beginning of the nasty dry season when ESD is particularly well-positioned to pump a couple of kilovolts into a very necessary chip from a hapless fingertip. So I started probing voltages while manually setting pin values in TurboCNC. But that’s not a definitive test. The most bothersome ESD effect is where a gate sort of half dies. Not completely dead, but not up to it’s pre-ESD-incident ability to source/sink current. The high-impedance input of your otherwise trusty multimeter can be fooled by such a faker. maybe I had fried one of the TORCAM 74HC240 buffers. I swapped two of these socketed chips inside the TORCAM box, but that didn’t solve the problem either. 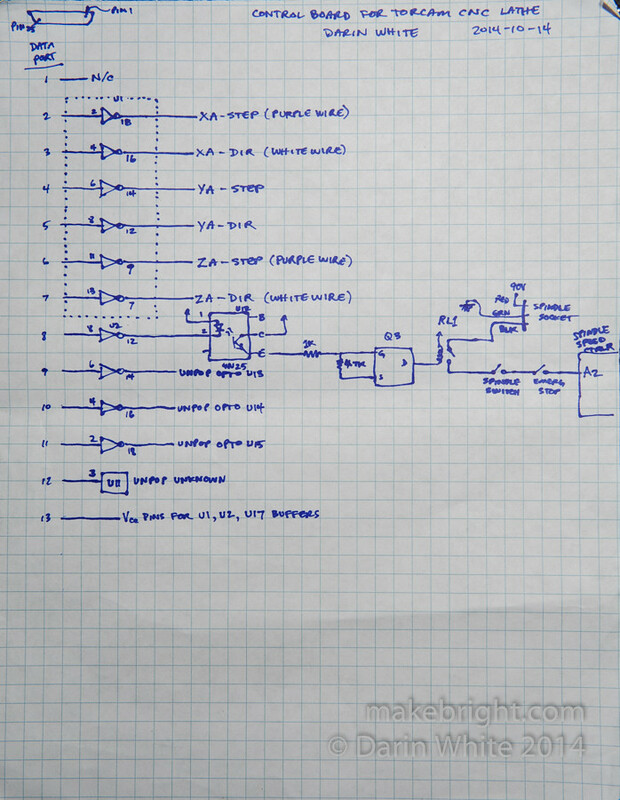 This all led me to break the signal chain down into component parts again and test each one as best as I could. 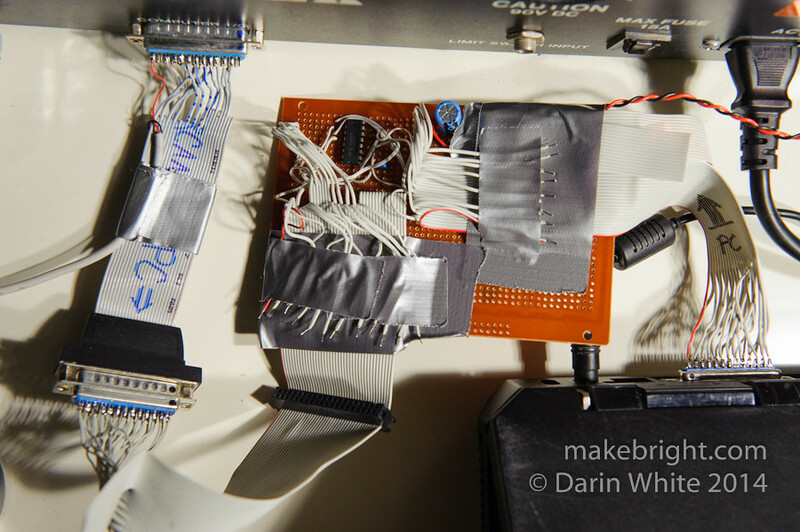 If you’re still with me, here’s the punchline: somewhere between soldering the adapter cable, testing it, and then hot-gluing it for strain relief, pin 6 had been shorted to ground. The heat from the glue must have softened up the connector pin housing, allow the pin to shift just enough to ground out. That certainly reaffirms the need to check and re-check. Now it all works smoothly and reliably. For fun, I fooled around with different frequency and acceleration rates for the two axes. After a couple of dozen test runs, both axes are still rockin’. I added a second MC14050 hex buffer the the board so I could use this same rig to drive the three axis mill, and pull in inputs like Emergency Stop, Limit, and four of the front panel buttons back to the PC just for fun in case we can configure those in Mach3. All of this is why James Bastow laughed at me as I carried the TORCAM box out of the high school, declaring I would only spend a couple of hours on this project and call it quits. Right! 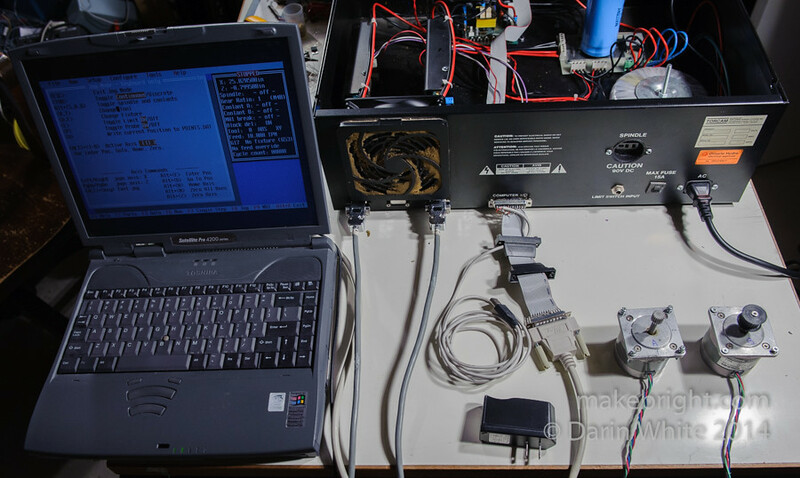 This entry was posted in maker resource and tagged CNC, refit, reverse engineer, tools. Bookmark the permalink. Cool. Oooh, and I was not aware of http://www.easel.com/ – thanks for bringing it to my attention!